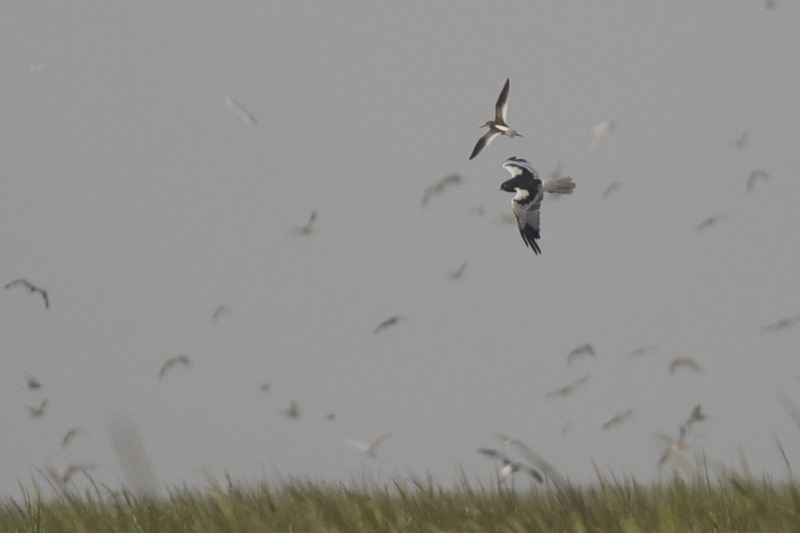 The fourth guest post on Birding Beijing is the first from a Chinese national. Followers of this blog will know that, soon after I arrived in Beijing last August, I arranged to visit a small town called Yangkou in Rudong County (about 3 hours north of Shanghai) to look for Spoon-billed Sandpipers. 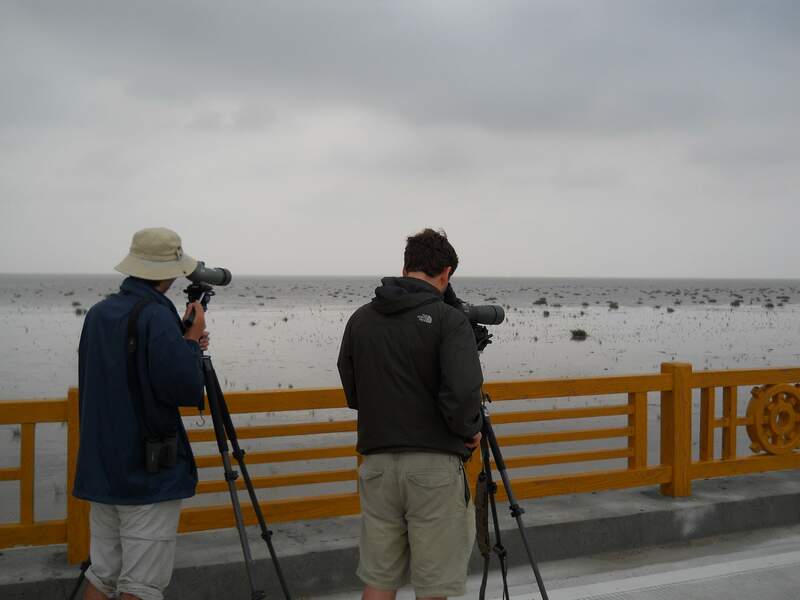 I set up the trip after contacting Zhang Lin at Shanghai Bird Tours and he accompanied me on a very memorable visit to Yangkou, showing me not only at least 3 Spoon-billed Sandpipers but also other sought after species such as Nordmann’s Greenshank, Reed Parrotbill, Grey-tailed Tattler, Long-toed Stint, Pied Harrier etc etc. The woods nearby also held huge numbers of migrants. In short, it was a superb place to go birding. In this post Zhang Lin provides a short introduction to Yangkou and how the visiting Spoon-billed Sandpipers, for which it is most famous, were discovered as recently as 2008. If you are thinking of going, I should warn you that this is a vast site and you would be very lucky just to turn up and see the Spooners. If you want to maximise your chances, Zhang Lin knows the most likely hangouts! In the summer vacation of 2008, a birder who works as a teacher in a police college in Nanjing city was sent to Nantong District for training. He chose the police station at Yangkou Town, Rudong County because it’s on the coast and he was hopeful for some migrants. 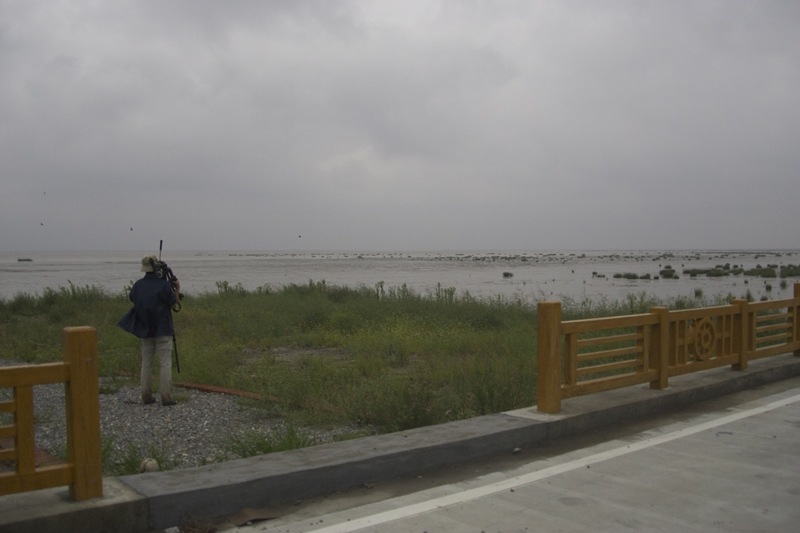 In his first few days he found the best site for shorebirds – thousands of shorebirds – plus hundreds of juvenile Saunders’s Gulls from the breeding ground in Yancheng District. Shortly afterwards, I stayed at the police station with him for a few weeks in July. Every day we went birding and, in mid- to late- July, we saw Nordmann’s Greenshank in full breeding plumage. We guessed that the Bar-tailed Godwits banded in Australia/New Zealand with satellite tracking equipment might roost there and, when the migration was in full swing, we saw that, indeed, from the satellite tracking data, a few were there, although we didn’t see any. It was a pity that he went back to Nanjing after the training and lost the chance to see the first Spoon-billed Sandpiper, which we also guessed might roost here. In mid-August, the first Spooner arrived! 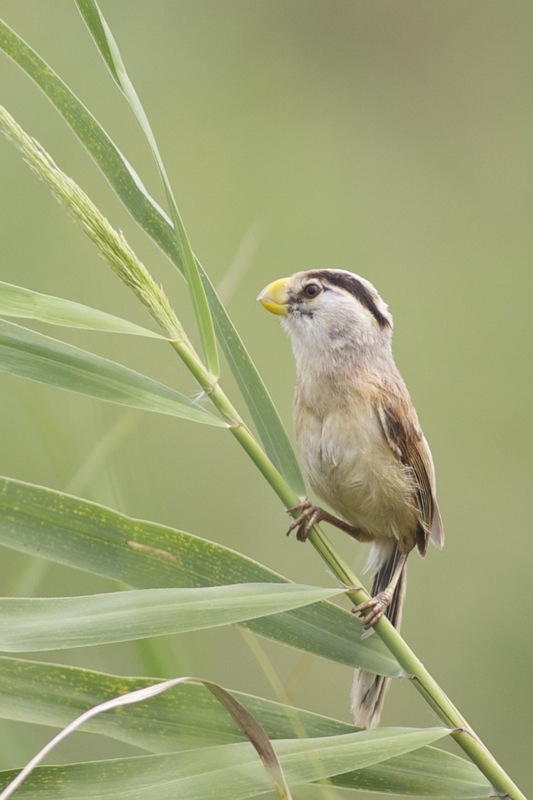 From August, other migrants such as passerines started to come. 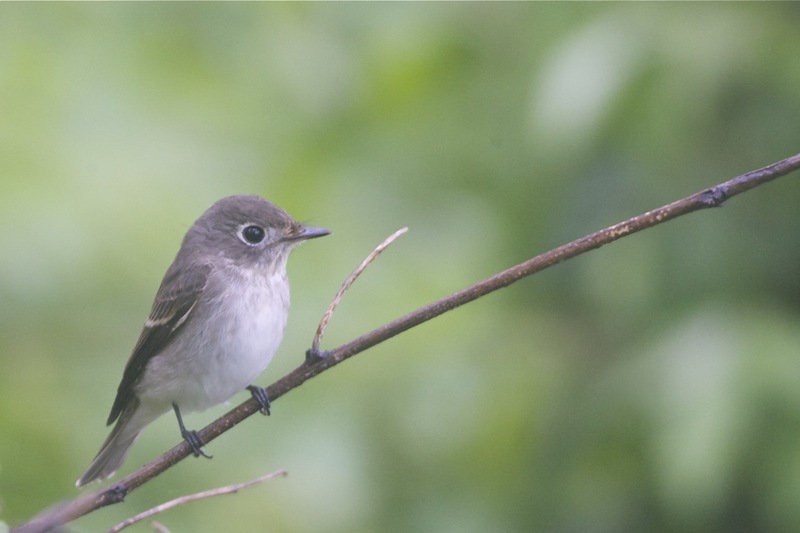 All the woods, bushes and reeds provided exciting birds – tens or hundreds of warblers, flycatchers, thrushes, robins, cuckoos… and probably the first record of Wood Warbler in East China. The coast at Yangkou Town in Rudong County is now established as one of the premier sites on the eastern coast of China. Thanks to the new Sutong Bridge built in 2008, we Shanghai birders only need three hours to drive there. With more and more visits to this small town, we have recorded more species than the nature reserves nearby such as Yancheng and Dongtan. However, as with all other coastal areas in China, Yangkou faces pressure from industry and there is much development, including land reclamation. 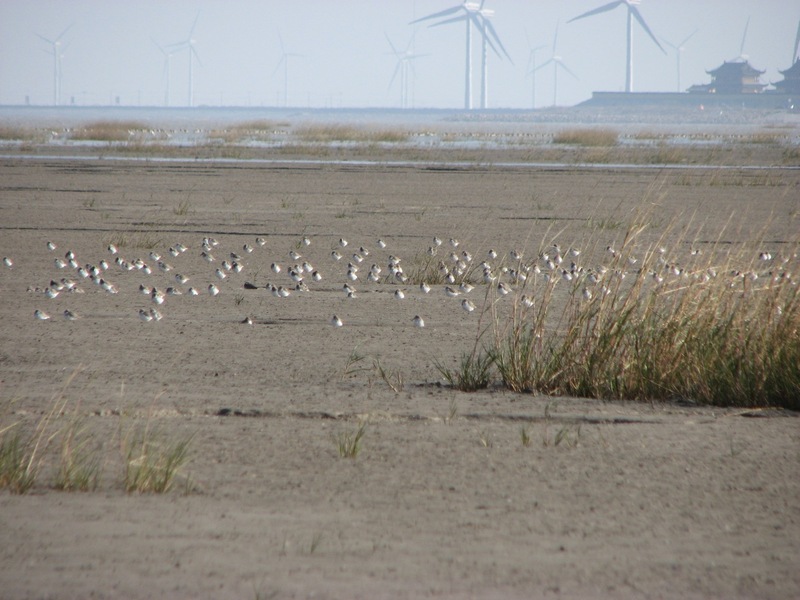 The local government is also developing ‘eco-tourism’, part of which involves planting famous invasive species such as Smooth Cordgrass on the mudflat to develop it into ‘Huanghai Steppe’. In 2008/2009, Smooth Cordgrass didn’t cover too much of the mudflat and it was still easy to watch shorebirds even from the seawall. However, in 2010 Smooth Cordgrass expanded further out very fast. Now, at low tide, birds tend to stay behind the grass, meaning that to see them we need to walk out onto the flats quite a long way. At high tide, some birds land on the mud between the patches of grass while some land into aquaculture ponds beside the seawall which makes counting them increasingly difficult. The mudflats at Yangkou. Note the encroaching cordgrass in the distance..
Zhang Lin was born in north China. He majored in Air Traffic Control in Nanjing City, where there were rich resources of woodland birds which attracted him to start birding. He’s also fond of astronomy and geography. Years ago Lin did shorebird banding in Dongtan Nature Reserve, Chongming Island. 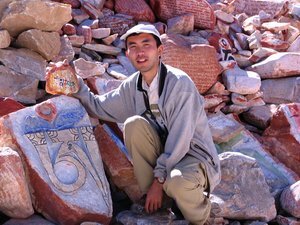 Having kept travelling, including to Xinjiang, Qinghai, Sichuan, Yunnan, Ningxia, Nei Mongal and Guangxi… for years, doing birding and biological research, he has much experience in birds especially in the Shanghai area. His interest in sound recording has helped a lot with his field identification skills. Zhang Lin is now one of the editors of China Bird Report published by China Ornithology Society and is a guide with Shanghai Birding Tours. He speaks Chinese and English. A video, hopefully conveying a sense of the trip to Rudong, can be seen here.. Starring local birders and Spoon-billed Sandpiper experts Zhang Lin and Tong Menxiu.